Four straight weeks of strong box office come to a screeching halt as we transition from November to December through the worst weekend of the year. As always, the weekend after Thanksgiving sees a burned-out marketplace take a week off to recharge. Still, Hollywood insists on not having a weekend go by without at least one release. Three actually come out in some semblance of "wide release", but only one is truly everywhere. 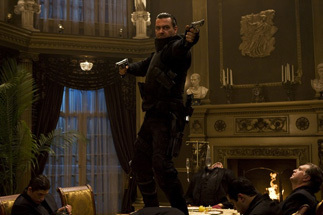 The Punisher: War Zone is the third attempt to make a movie franchise out of the Marvel comic about a vengeful renegade cop, and the second in just four years. After Dolph Lundgren in the 1980s and recently, Thomas Jane failed to make the project tick (the latest version grossing just $33 million), it's been handed over to Ray Stevenson, a British actor whom you probably know from the HBO series Rome. And although it doesn't seem to be his fault, Stevenson doesn't seem to have made it work, either. Maybe no one can, and it might be time to face the fact that this just isn't a character that people care about. The kind of machismo gunplay it offers hasn't been popular with audiences since the Reagan administration and has largely been replaced with martial arts films. And while comic movies continue to be hot, I don't think that the general public really recognizes Punisher as a comic character. We should also consider the fact that Stevenson is an engaging and charismatic guy, but he's just not well known enough. Lionsgate is probably right to dump this film on this weekend in just 2,500 venues, and I'd look for a weekend of about $9 million. A couple of smaller films also debut, with Cadillac Records and Nobel Son hitting theaters. The first is, somewhat confusingly, the story of the rise of the Chess Records record label, one of the foremost blues and gospel labels of the 1950s. Adrien Brody stars as Leonard Chess, the label's founder, with a number of other major talents from that era portrayed in it, like Muddy Waters, Chuck Berry, Howlin' Wolf, and perhaps most notably from a marquee factor, Beyonce Knowles as Etta James. Although on the surface this might seem like Ray-times-10, what it really does is chop up the focus of the film and make it more about the process of making music than the musicians' lives themselves. That is not a recipe for a box office hit, and I don't see the appeal of watching a collection of actors sing other people's songs. Opening on 686 screens, I expect about $4 million for this in its debut. Nobel Son is barely worth mentioning except for its release on about 900 screens. A thriller dumped on this weekend from the director of Bottle Shock, it stars Bryan Greenberg as a son of a potential Nobel Prize-winning scientist (Alan Rickman) kidnapped on the eve of his father's big award, for the $2 million in prize money. Bullets and epithets fly in a Tarantino-lite thriller that feels like an STV movie that escaped. Coming from studio you've never heard of, don't look for more than the bare $2 million here.